Gal An abbreviation for one gallon. Gas Plant A facility that takes natural gas, removes impurities and separates the hydrocarbons into their various components. 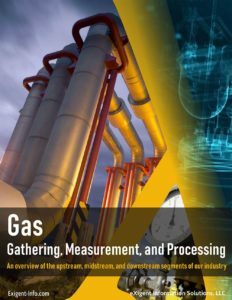 Gas Processing The separation of components by absorption, adsorption, refrigeration or cryogenics from a stream of natural gas for the purpose of making salable liquid products and for treating the residue gas to meet required specifications. Gas-Oil Ration Measure of the volume of gas produced along with oil from the same well. Gathering Lines Pipelines that collect gas and oil from more than one location and deliver it to a central facility or delivery point. Gj An abbreviation for gigajoule, equivalent to one thousand megajoules or one billion joules. GPM Gallons per Mcf, the number of gallons of a particular component per Mcf. Gross Heating Value The heating value measured in a calorimeter when the water produced during the combustion process is condensed to a liquid state.Ê The heat of condensation of the water is included in the total measured heat.